.:. Chelsea Station Editions—Connecting books and readers .:. First published in 1996, Walter Holland’s début novel is a moving testament to the power of friendship during even the worst of times. 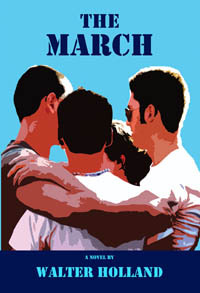 Beginning on a hot summer night in 1980, The March revolves around a circle of young gay men and the many others their lives touch. Over time, each character changes in unexpected ways; lives and loves come together and fall apart as society itself is altered by the onslaught of AIDS. Walter Holland, Ph.D., is the author of two books of poetry A Journal of the Plague Years: Poems 1979-1992 and Transatlantic, as well as a novel, The March. His short stories have been published in Art and Understanding, Harrington Gay Men’s Fiction Quarterly, Rebel Yell, and Mama’s Boy: Gay Men Writing About Their Mothers. Some of his poetry credits include: Antioch Review, Art and Understanding, Barrow Street, Bay Windows, Body Positive, Christopher Street, Chiron Review, The Cream City Review, Found Object, Men’s Style, Pegasus, Phoebe, and Poets for Life: 76 Poets Respond to AIDS. He lives in New York City and teaches poetry and literature at The New School as well as works as a physical therapist. Clicking on the logos below will take you directly to each vendor’s purchasing page for The March.